Claudia F. Savage is a member of the performance duo Thick in the Throat, Honey and co-runs a parent-artist podcast of the same name. She has published three collections of poetry, most recently, Bruising Continents (Spuyten Duyvil). Her essays, interviews, and collaborative work appear widely in print, onstage, and in galleries and often explore the theme of refugees and diaspora. 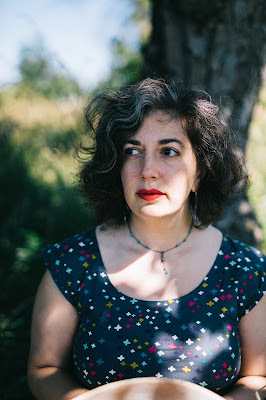 Recent work can be found in BOMB, Denver Quarterly, Columbia, Nimrod, Water-Stone Review, and Anomaly (where she writes the series, "Witness the Hour: Arab American Poets Across the Diaspora"). She is a 2018-2021 Black Earth Institute Fellow, a progressive think tank that focuses on the intersection of the environment, social justice, and spirituality. She’s garnered awards from Jentel, Ucross, The Atlantic Center for the Arts, University of Oregon, RACC and Mineral School. Her collaboration, reductions, about motherhood and ephemerality, with visual artist Jacklyn Brickman, is forthcoming in 2020. She teaches privately and as a Writer in the Schools and lives with her husband and daughter in Portland, OR. My first full collection, Bruising Continents, came out from the wonderful Brooklyn-based Spuyten Duyvil Press in 2017. I'd published several chapbooks prior to that. I'd say that publishing Bruising Continents after almost 10 years of writing and submitting was a relief. So many of the poems in the book were out there in the world but I couldn't get the full collection out (despite being a semi-finalist and finalist more times than I will share!). When it was accepted, I felt free to pursue the 2 other books I'd been working on for years. Mostly, I learned so much from all the insanity of book touring, promotion, and selling, that I just needed to experience for myself and figure out. I'd spoken with loads of friends about their books, but you have to do it yourself to realize what works and what doesn't work for you. Bruising Continents was also very focused on my personal life, while my next two collections are more about what is happening in the world. Actually, I was a musician first (I started playing piano at 4 and cello at 10). So, the poetry was an extension of music for me. I've always been a voracious reader. Now that I'm teaching my daughter to read I realize I can't remember a time I didn't know how. I always loved reading out loud and rhyming came very naturally, as it does to most children, so the musical quality of poetry was inherent in my acquisition of language, and, I feel like the fact that I was learning music at the same time made the two combine in some way. I still always write for sound before almost anything else. That musicality is what also makes me fall in love with other people's work. One of my favorite books of non-fiction is The Anthropology of Turquoise by Ellen Meloy. Every line is an oral feast. She is quoted as saying, "I thought [as a girl that] I would never survive my imagination." Isn't that the best? I usually have 2-3 projects going at once (and I'm always working on something), letting the demands of the day determine what I work on. Often one of the projects requires less of me emotionally and sometimes, if my kid is sick or I'm exhausted from lack of sleep, I'll work on whatever is less taxing. The initial drafts come quickly for me. The real work happens when I edit. I'll edit forever if I let myself. Sometimes I create 30-40 drafts of a poem. Except when I'm working with my performance duo on a piece. Often, I create something quickly and the editing happens as we work on the performance part of it. Those pieces also live inside of me as I memorize them, so they are constantly morphing. Since having my daughter, I tend to work in longer form--either a very long poem or on a book project. I'm also gravitating towards poets who work in longer forms--whether that is a long poem or something thematic that spreads over many books. Nathaniel Mackey comes immediately to mind, but I feel like Wanda Coleman had similar concerns as well. She's a favorite of mine, especially since I've become a mother. She raised two kids by herself. Her work has such heft! Alice Notley, too. I always come back to her long poems. They require such an oceanic dive of consciousness. And, H.L. Hix. Brenda Shaughnessy's "Our Andromeda" gave me so much permission. As did Carolyn Forche's abecedarian "On Earth" from Blue Hour. I could go on and on. Once you get into long forms, you kind of can't get out. It's a good thing, I think. Seeing a collection with carefully crafted individual poems doesn't speak to me much anymore. I want shimmering woven poetic fabric. In the past 5 or so years I've been memorizing and performing my work. It is an integral part of my process and I really enjoy it. I also perform regularly with my duo: Thick In The Throat, Honey. Music has become the center of my life again except it is trying to live in my poems instead of in a piano. I rarely read my poems from a text, and, usually only if they are very new. The performance aspect of reciting my work informs future revisions and thoughts about the work as a whole. This has become especially true as I work through my poems about Syrian refugees and jazz improvisation. How can you perform work about either of those things behind a podium? They both want to move through a vulnerable body that does not hide. I'm always thinking about suffering. Can we ever stop hurting each other? Does art offer a kind of succor? Does giving a voice to suffering alleviate it or put salt in the wound? How do we heal from what seems irreparable? That's a huge question and feels especially loaded right now. We so desperately need art to help/save us, yes? During the Kavanaugh hearings, after seeing another Trump rally, reading The Atlantic, I find myself turning to Saturday Night Live for relief. Thank you Matt Damon. Thank you SNL writers for sanity-making. Writers can offer relief. They can offer perspective. They can be the type of mirror we sometimes can't take but need nonetheless. I won't say what they should do, since I appreciate those that offer satire, as much as thoughtfulness. I read The Atlantic Monthly and Harper's for one level of cultural commentary and then I look to poets like Morgan Parker, Ocean Vuong, and my dear friend Stephanie Heit, for another. All I expect of writers is that they do their work with respect and integrity, and, hopefully, make language sing in the process. I've never used a formal editor for my poetry but I had a wonderful mentor (Max Regan, I'm looking at you!) who was super insightful at the beginning of my poetry life and I have two poets (Stephanie Heit and Joanna Preucel) who have read my work for many, many years and I trust implicitly. They have a critical hand in everything I do and I owe them so much for being deeply attentive to my actual words and what I hope for in my work. They push me and question and encourage all at the same time. I've had editors at literary magazines offer suggestions that were very helpful over the years and, depending on the project, I've sent my book drafts to a handful of other thoughtful writer friends for feedback once it feels close to done. My husband, John, has been my first listener for over 10 years now. He listens with a musician's ear and that can be really helpful for what I'm trying to accomplish. Oh, man, this question is impossible for me. I listen to advice, but rarely take it. That makes me sound like such a brat. Maybe I am. A wise Buddhist friend once told me to stop stressing about things out of my control (I tend to be a serious worrier) and just approach new experiences with beginner's mind. Referring back to that idea is often very calming for me. Oh, and, in line what that idea, the phrase "do less" is amazing. So much anxiety is released for me when I focus on those two words. My to-do lists tend to be horrific. Lately, I've been focusing on only accomplishing 3 things a day so I can enjoy more time with my daughter and husband and community. I spend very little time on social media. 10 - How easy has it been for you to move between genres (poetry to performance to collaboration)? What do you see as the appeal? Actually, that is the thing I enjoy most about having a performance duo. I'm always trying out my poems-in-progress with a musician. And, even better, I get to have pieces I'm working on live in various forms. With my duo, I tend to be more outrageous, more experimental and I rhyme more. There is opportunity for deep play in terms of form and improvisation. I often memorize a poem one way, perform it slightly differently, and then, watch it change on the page as a result. It helps that my duo partner is a master improviser. He's good with whatever happens when we perform and has no fear. That has given me more courage in terms of performance and on the page. I highly recommend every writer run out and find themselves an open-minded musician to work with! I also collaborate with visual artists, but that's another story entirely. It really helps working with another art form to get you out of your usual process. There is no typical day for me. I just make sure to schedule in time to write every day, especially when I'm trying to complete a book. This could be 15 minutes or 2 hours, depending. Over the years I've discovered that it is not the quantity per day that matters most, but the fact that I return to the work each day so that it occupies my mind. Writing time is always pleasure, even when I write crap. It is a gift and I'm kinder and more patient with my family when I give that time to myself. I've never had writer's block or stalling. There are always things happening in my head that I want to make into something, whether it is a response to a performance, something I read, or a conversation I've had. I guess I've always had the problem of too many ideas and not enough life space. I tend to write very prolifically and find myself easily enchanted/distracted by new ideas or directions. My issue is never inspiration, but actually focusing on one idea long enough to make a book or performance from it. I have hundreds of poems that have never seen publication and will probably never be a part of a book. My process is more trying to tame the tornado. Baking bread. I make bread almost every week for my family in fall and winter. That smell of yeast and honey brings me right back to my mother's kitchen, my grandmother's kitchen, and, now, the home I've created for my family. A local baker in Portland has a tee-shirt that says, "This body made by gluten." I want one that says, "My sanity saved by bread." My daughter mixes dough with me and makes her own mini-bread just like my mother did with me. I even wrote a piece about it. Kneading is therapy for me. I've written many times about the natural world being the source, the deep well I continue to dip into in order to fill up my energetic reserves. Nothing prepares me more for writing than a walk through a forest, up a mountain, or a long walk on a cold, damp Oregon shoreline. The more mud and wind the better. It is the moving of blood through the body, but, also, it is the overall sensual experience of being outside that does it--the visual, the smells, the way grasses or sand or a rock feels in my fingers. I'm also always inspired by visual art and music. My mother was a painter and I still remember her taking me to museums and galleries as a child and letting me spend as much time as I wanted in front of something. I could go on and on about music. The rhythm, the intricacy, always gets me and informs what I'm working on. Right now, working on my improvisation and refugee book, I'm listening to loads of jazz--Alice Coltrane, Pharoah Sanders, Peter Brötzmann, Tim Berne, Joëlle Léandre, Nicole Mitchell, Geri Allen. I could go on and on. Alice Coltrane is so incredible, I get teary writing about her. She expands you. If only I'd listened to her when I was learning to play piano. Her mind and heart are the size of the universe. I'm a huge fan of the small book, Free Play: Improvisation in Life and Art by Stephen Nachmanovitch, that John gifted to me when we were falling in love. Also, the book, I Send You This Cadmium Red, the collaboration between John Berger and John Christie has been a touchstone of what is possible with a long-term collaboration and artistic friendship. I also return to the work of Wanda Coleman and Alice Notley for inspiration as deep thinkers, poets and mamas juggling multiple jobs, child-rearing and phenomenal artistic production. So many things! Thanks to the generous fellowship I just received from The Black Earth Institute, I'm going to be putting together a performance of my book-in-progress with a large musical ensemble, and, possibly some film and dancers. I've worked with a lot of different artists, mostly musicians and visual artists, but I've never before put together a performance of this scale. I also have ideas of how to involve community in this process. So, I guess what I'm hoping to do is to take my book fully off the page to live as a performance piece and a form of dialogue. It feels very improvisational and where I want my work to go more and more. To be more fluid in how it is created and received. I'd also like to finish the novel and the non-fiction book I've had eating their heads off in a drawer (paraphrasing Isaac Asimov) for many years. I always thought I would be a musician, but I got burned out by 17. I used to do concerto competitions and was really good at memorization and rendering. I won many of them, but I got tendinitis and, then, I lost the joy in just making music and I stopped completely by the time I was 19. Now, over 20 years later, I'm trying to pick it up again so that I can play music with my husband and daughter. Just for fun. Just for us. After I decided I wasn't going to be a concert pianist, I realized that I was going to get stuck playing in bad jazz bars or for a church choir or something if I kept doing it. Both were deeply unappealing to me. I thought about music therapy for a while, but that kind of fizzled. Honestly, I'm still figuring it all out. I'm over 40 and I'm finally realizing I might be able to craft a life doing what I enjoy instead of always worrying about the bills. That's mostly because I've realized how little I can live on, not because I'm getting huge checks in the mail! Oh, I've done lots and lots of things (cooked for people going through chemo, been a waitress on roller skates, did outreach work for the Girl Scouts, been an environmental writer). So, I think the question should be, why do I keep on writing, or, what has made me start and keep on doing it. Engaging language--its sounds, its meanings, its constant shifts and malleability--gives me such joy. It is the only "job" I've ever had that hasn't bored me. I have a hard time thinking of it as a job instead of just a love affair. This is the hardest question in the world. I can't do one, so I'll name a few that recently tore apart my heart or head or both: My God is This a Man by Laura Sims, Four Cities by Hala Alyan, Cloud-Net by Cecilia Vicuna, and The Gene by Siddhartha Mukherjee. I don't watch a lot of movies or TV, so I'm way behind everyone. The last video I saw that transformed me was Sofia Coppola's Lost in Translation. I adore her films. The light, the pacing, the deep attention. She's such a poet. I'm working on two books at the moment--one is about the Syrian refugee crisis and jazz improvisation and the other is about the loss of my mother and brother and the color spectrum. I've got good drafts of both, but I'm trying to finish the improvisation book first since it has the most urgency and my Black Earth Institute fellowship for 2018-2021 is to support its completion. The fellowship will also support a performance and tour I hope will happen in 2020-2021. I'll be collaborating with John on part of this, along with many other musicians and poets. We're in the creation/scheming part of everything. It is the glorious work and is helping me get up each morning in light of our current political insanity. The world is losing its mind even more than usual. Part of the joy of the fellowship is that The Black Earth Institute hosts a weekend retreat each year and all the fellows get to support, encourage, and commiserate while we are fed amazing food and engage this heavenly land in rural Wisconsin. I feel like I have all these phenomenal activist-artists who are making challenging, necessary work, and have my back for doing the same. I believe in the power of the collective. This work has incredible juice.